Inspired by shadows, silhouettes, pattern and organic forms, my glass work contains inclusions of various metals which create organic shapes, textures and distinctive colours. Fabric patchwork and stitching into textiles has also influenced and is evident this work. 'Meander' takes its inspiration from the way that farmer's fields and crops remind me of patchwork, and how the river can produce such beauftiful shapes and curves. 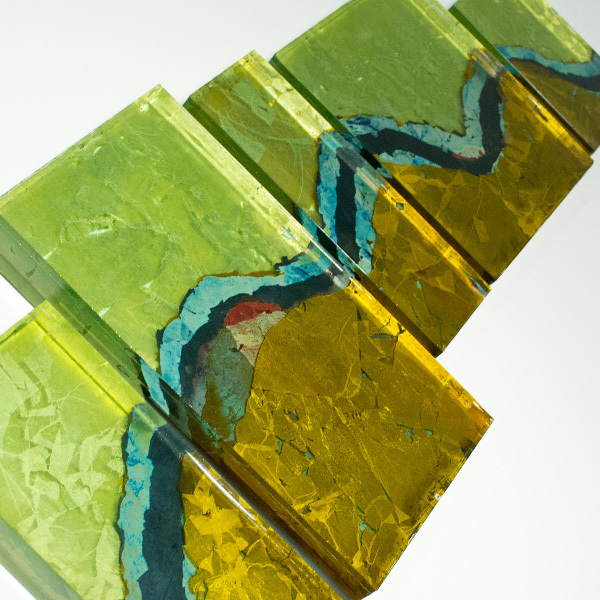 This work has been created by layering glass with metal inclusions to achieve depth and fluidity within each block. Placed in succession and aligned they recreate the twist and flow of a river.